We hold a monthly meeting on the 2nd Saturday of the month at the Holiday Inn, Wilsonville. The physical address is 25425 SW 95th Ave., Wilsonville, OR 97070. Meeting times are:10:15 am to order Breakfast and 10:45 am meeting starts. 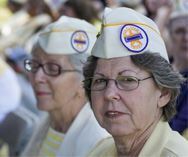 We participate in Veterans events all year long.